Taking care of your car’s carpet and floor mats can make a big difference in the overall appearance of the vehicle. Crumbs, dirt, and trash can easily accumulate on the floor of your car. Fortunately, cleaning car mats and carpeting is a simple element of auto detailing that you can do on your own. Before you start, pick up any objects lying on the carpet. Make sure to pick up all important small objects and loose change. Your car should be as empty and organized as possible before you begin cleaning. You should also take out the floor mats and shake off any dirt or crumbs. Then, vacuum the entire carpet with a handheld vacuum. Make sure to vacuum under the pedals, under and around the seats, and in any other crevices. Once the floor is completely free of dirt, you can focus on the carpet. Search for any stains or spills, and try diluting the spill with a small amount of cold water and blot it with a towel. For best results, use 303® Spot Cleaner. 303 Spot Cleaner is a premium cleaner formulated to remove the most difficult carpet and upholstery stains. For most effective results, treat stains immediately. Start by testing a small area for colorfastness. If color is affected, do not use. Spray entire area with 303 Spot Cleaner until damp. Blot or rub area with a clean damp cloth, rinsing out cloth as required. If necessary, repeat until stain is completely removed. Avoid rings by cleaning the entire section where the stain occurred. Do not mix 303 Spot Cleaner with bleach or use with any other household cleaner. While waiting for the carpet to dry, you can clean the floor mats. Like cleaning the car’s carpet, cleaning car mats is a simple process. First, vacuum the mats with a handheld vacuum. Then, spray with 303 Multi-Surface Cleaner which quickly removes even the most stubborn spots from coffee, oil, grease and ink from virtually any material or surface. It will work great on your rubber or plastic floor mats! Be sure to hang the mats up to dry so both sides can dry quickly. 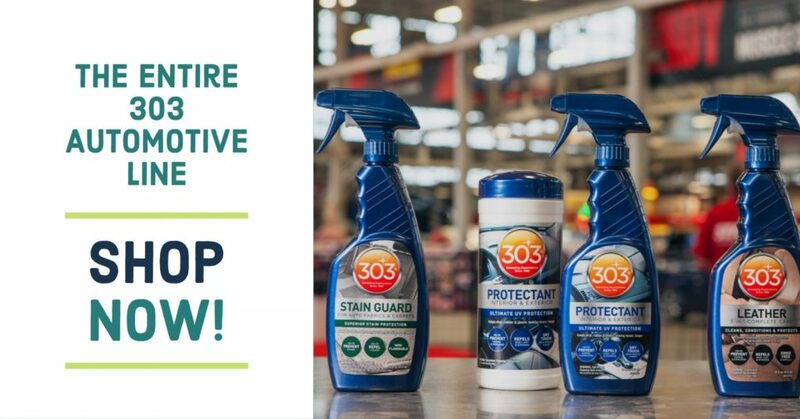 For preventative care, 303 Stain Guard for Auto Fabrics & Carpets helps prevent stains and repels liquids caused by; hot coffee, soda spills, food, pet stains, and everyday dirt and mud. 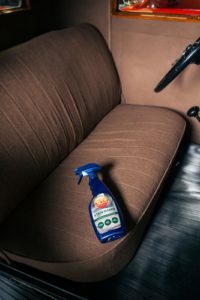 It is safe to use on your fabric seats, as well as the carpets/fabric floor mats of your vehicle. Sometimes auto detailing can be a boring and difficult task. However, washing the floor of your car should be stress-free and easy if you follow the right steps for cleaning your car’s carpet. Overall, a clean car carpet can make your car feel cleaner and fresher, making the time you spend driving much more enjoyable. Great Post. It’s very difficult to clean the car carpeting but here I found the easy way to clean the carpet in short span of time. Thanks for Sharing such a great content. what is the best GREEN way to get rid of dog smell on your car carpets? love to hear your thoughts thanks. Hi Joe, unfortunately we aren’t experts in this area. sprinkle baking soda in the car carpet and allow the penetrate with your hand. Leave it overnight and vacuum the next morning. best all purpose cleaner & deodorizer (learned this decades ago from a professional steamcleaning company specializing in houses/carpeting) is VINEGAR. It has some antimicrobial properties & is the best ‘organic’ odour absorber. It’s non-toxic. Do not saturate with straight vinegar as it is acetic acid (can be slightly corrosive). But use boiling hot water & vinegar mixed with mild dish soap [or without the dishsoap] for spot stain removal & cleaning. Vinegar/water in a spray bottle can be used on all surfaces of car interior OR exterior (cleans glass). Vinegar absorbs some toxins. Baking soda is supposedly absorbent…but it’s not great for removing cat or dog odour. It also is gritty & has to be vaccum’d up. Vinegar & water does not. But do not ‘saturate’ surfaces. Vinegar also cuts greasy, oily substances. I’ve used it over the years to soak clothing soaked with diesel fuel or get MILDEW out of fabric. It’s great for a variety of things & cheap for a 4 liter jug. It will clean up coffee, milk spills that have gone sour…it’ll cut through gummy substances, cleans up bird poop off the hood & sun roof etc!! Looking for an effective car steam cleaning machine? There are many models available on the market but the most versatile machines are capable of effectively removing dirt and stains from places such as dashboards, steering wheels, windows, and more. Steam cleaners can be used even for cleaning trucks, RVs and boats. The advanced machines feature adjustable pressure levels up to 150 psi and steam temperatures reaching 386°F.